When was the last time you handwrote something? It probably wasn't today, and it was probably a phone number or a grocery list (even though there's an app for that). Most of our written communication is done via typing, but most of us know very little about the fonts we use to chat with our friends or craft our e-mails. The fonts we use are illustrative of the times we live in—in 2007, Microsoft did away with Times New Roman as its default typeface for Word, replacing it with Calibri, a more rounded, sans-serif font. Times New Roman was created for a newspaper, The Times, because serif fonts are easier on the eyes for long blocks of text, and narrower fonts are great for newspapers, which need to fit as many words as possible in a small space. Calibri, on the other hand, belongs to a font family that would ordinarily be used for larger mediums such as headlines or advertisements. Does this switch shed light on a shift towards shorter, snappier writing? It's possible. The Garamond we use today, Adobe Garamond, was designed in 1989, and a revamped version, Adobe Garamond Pro, was released in 2000, but the font's history goes back centuries. Its creator, Claude Garamond, was born in 1480 in Paris. He trained with a punch cutter, and went on to work as a publisher and design a number of typefaces. Garamond the font was adapted from an earlier font called De Aetna, and was first used for a book titled Paraphrasis in Elegantiarum Libros Laurentii Vallae. Today, it's the font used in the American editions of the Harry Potter series as well as the Hunger Games series. It's also Dave Eggers's favorite font, and the font used for McSweeney's Internet Tendency. Says Eggers, "[Garamond] looks good in so many permutations—italics, small caps, all caps, tracked out, justified or not." Baskerville was originally created as a way to improve upon the fonts of William Caslon, who was a bookbinder and an engraver of gun locks, which, in the early 1700s, was a legitimate way of earning a living. Caslon's typefaces were widely popular in England, and were used for the first printings of the Declaration of Independence and the Constitution of the United States. They inspired John Baskerville, a businessman who sold papier-mâché, to create an updated version himself. (Fun fact: John Baskerville was likely the inspiration behind the title of Arthur Conan Doyle's famous Sherlock Holmes story.) His types were used for an edition of Virgil that he printed on woven paper, a folio Bible, and works produced by the University of Cambridge. Benjamin Franklin was a huge fan of Baskerville's typeface, and may have been responsible for bringing it to the United States, where it was used for a number of federal government documents. Baskerville is considered a transitional typeface—it has "less calligraphic flow" or handwritten quality than earlier typefaces. Helvetica was created much later than the two aforementioned fonts, but it's quickly become much more culturally pervasive. It was developed in 1956 by two designers, Max Miedinger and Eduard Hoffmann, in Switzerland for Haas Type Foundry. The goal was to create a typeface that could be used for larger signs, so the designers aimed to produce something neutral and clear. The pair used a few existing fonts, including the then-popular Akzidenz-Grotesk, as jumping-off points. Today, Helvetica is used by a number of organizations and companies, including New York's subway system, Washington D.C.'s metro system, the United States' federal income tax forms, McDonald's, Target and Microsoft. Fun fact: "Helvetica" is Latin for "Swiss." 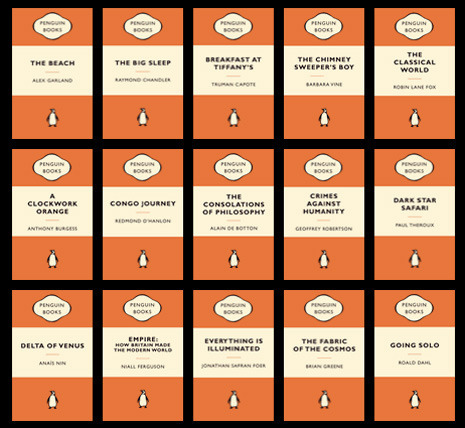 Avid readers may recognize Gill Sans as the font that's used on Penguin's paperback classics. It's also used for all British and Spanish government logos, as well as the BBC and SEPTA, Philadelphia's transit system. It's been called the British Helvetica, and for good reason. Like Helvetica, Gill Sans is sleek and without ascribed meaning. Unlike Helvetica, Gill Sans was created somewhat accidentally; its creator, Eric Gill (who also designed Perpetua, another popular typeface), was a sculptor and printmaker, and was asked to paint the facade of a bookshop in Bristol. The lettering he used would later become Gill Sans. Gill was commissioned to design a font that could compete with the clean-lined German fonts being produced at the time, including Futura. Versions of the typewriter have been around since the early 1700s, but American Typewriter, a font you might've come across while roaming the streets of New York City or while writing on your Apple computer, was created in the 1970s, just as the popularity of typewriters began to dwindle. The typeface was developed by Joel Kaden and Tony Stan, and was meant to appear similar to the text created by the Sholes and Glidden typewriter, which was invented in the 1860s. Christopher Latham Sholes's machine was the first to use a QWERTY keyboard, which is designed as such because common letter combinations are spaced out to avoid jamming. His invention was initially not received warmly by the public due to its high cost. Arial is often considered one of Helvetica's competitors—in fact, it's been criticized for being too similar to Helvetica. It was developed by a 10-person team in 1982. It's based on an earlier typeface, Monotype Grotesque, which was created in the 1920s. The team that crafted Arial changed the proportions of Monotype Grotesque, and the result was a font that is proportionally almost identical to Helvetica. Contrary to popular belief, it was not designed for Windows, although it is one of the core fonts used by the company. It was actually commissioned for IBM, to be used on their laser printers. Stanley Morison, the creator of Times New Roman, was asked to design the font after he publicly declared that the British newspaper The Times used poorly designed typefaces. Interestingly, Morison later went on to serve as the editor of The Times Literary Supplement and a member of the editorial board for Encyclopædia Britannica. Times New Roman is narrower than other fonts, particularly when bolded. The reason for this is that newspapers prefer narrower fonts, which allow them to fit more words on each line. Ever since Microsoft Windows 3.1, the company used Times New Roman as its default typeface for its word processing programs. But, in 2007, the font was replaced with Calibri, a rounded sans serif design created for the company's ClearType technology, an initiative to make onscreen text more readable. Paul Renner created Futura in the 1920s. His aesthetic reflects the philosophy of the Bauhaus movement (though he was not directly associated with this movement). The font employs basic geometric shapes and clean lines, avoiding any unnecessary elements. The circular elements feature near-perfect circles, and the strokes of each letter feature near-congruent weights. The font is now used in the logos for Volkswagen, IKEA and Crayola. It's the favorite typeface of both Stanley Kubrick and Wes Anderson, who uses it in a number of his films, most notably "The Royal Tenenbaums." It was also the first typeface to make it to the moon, as it was used on a plaque left by the astronauts of Apollo 11.